Particulate Hood protects firefighters against toxins. Designed with firefighter input at all stages of development and testing,Â NFPA 1971-certified Life Guard Hood blocks hazardous, carcinogenic particulates in both air and water. Breathable, multilayer, composite material and roomy design safely promote flow of air around head and neck, while balanced Thermal Protective Performance and Total Heat Loss design supportsÂ dry and comfortable wearÂ even after hours of use. Inspection port lets users completely turn hood inside out toÂ assess barrier. Dayton, Ohio — Honeywell (NYSE: HON) today announced the new Honeywell Life Guard Hood for fire fighters that features an innovative, patent-pending design and proven fabrics that provide better blocking protection against hazardous particulates compared to traditional hoods. The new Life Guard particulate hood is Honeywell’s latest breakthrough in safety and comfort for first responders. Replacing the traditional “sock hood,” the Life Guard Hood delivers new laboratory-proven levels of particulate-blocking protection with a lighter, more roomy fit that integrates with self-contained breathing apparatus (SCBA) and turnout gear to ensure the highest level of comfort and safety. New building materials have made structure fires far more hazardous. Modern synthetics release lethal gases and toxins when burned. Studies show that the skin and glands of the neck and face are especially prone to absorbing toxins, and some cancer rates have now been proven to be higher for firefighters than the general population. Blocks carcinogenic particulates in both air and water. Materials with proven durability yield a long wear-life and reduced cost of ownership. Inspection port enables users to completely turn the hood inside out to inspect the barrier. Patented Mask Mate™ face opening better fits the shape of air mask and provides a wider field of vision. The new Honeywell Life Guard is NFPA 1971 certified. 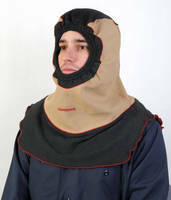 For more information on the new Honeywell Life Guard particulate blocking hood, visit www.honeywellfirstresponder.com/en/products/hoods/life-guard-hood . Honeywell (www.honeywell.com) is a Fortune 100 diversified technology and manufacturing leader, serving customers worldwide with aerospace products and services; control technologies for buildings, homes and industry; turbochargers; and performance materials. Based in Morris Township, N.J., Honeywell's shares are traded on the New York, London, and Chicago Stock Exchanges. For more news and information on Honeywell, please visit www.honeywell.com/newsroom . 1 “Taking Action Against Cancer in the Fire Service,” Firefighter Cancer Support Network (FCSN), August 2013, http://firefightercancersupport.org/wp-content/uploads/2013/08/Taking-Action-against-Cancer-in-the-Fire-Service.pdf. Honeywell supported the printing and distribution of FCSN’s 2013 white paper and is a partner for FCSN’s ongoing “Wash Your Hood Sunday” campaign. Honeywell did not have editorial input on the white paper’s content.